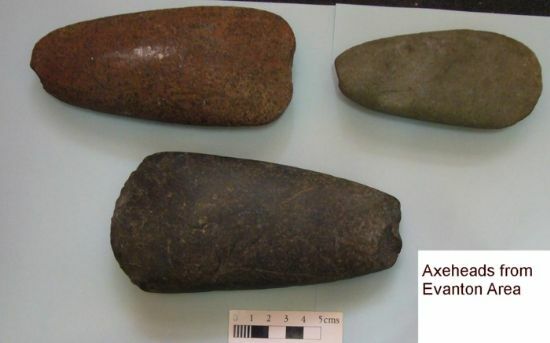 These three Neolithic stone axeheads were found in the Evanton area. The polished example (bottom) is from Drumore, an area with a number of examples of prehistoric rock art. There are also several Neolithic chambered cairns in the vicinity. Axes were needed by people to cut down trees and shape wood for tools and other objects. However, some stone axes must also have had a ritual function, since many are unused and highly polished, or, like an example from across the Cromarty Firth at Kinbeachie, very small. These utilitarian and ritual axeheads are found throughout the UK and Europe, showing a shared technological and belief system. The axeheads (or raw material) were widely traded. It is striking that stone axeheads were found at all of ARCH's eight Community Timeline courses, with new examples in two of the areas. Axeheads continue to be found, and there are undoubtedly many still to be reported. Stone from four areas can be easily identified: from Killin near Perthshire, from the Lake District, from County Antrim (see Find of the Month April 2010), and jadeite from the Alps on the continent. Axeheads from all these areas are found in the Highlands, showing that the region fully participated in this exchange of high status objects. In addition, other types of stone were also used, including flint which must have been sourced from outwith the Highlands. Some axeheads were clearly made locally, as shown by roughouts from Littleferry near Golspie and High Pasture Cave on Skye. Only one fairly complete wooden haft survives from Scotland to indicate how they might have carried, preserved in the peat at Shulishader on Lewis. The three axeheads from the Evanton area are in the National Museum of Scotland, although not on display. Sheridan, Alison 1992. ‘Scottish stone axeheads: some new work and recent discoveries,’ in Niall Sharples and Alison Sheridan (eds), Vessels for the Ancestors, (Edinburgh), pp. 194-212. Cooney, Gabriel 2004. ‘Neolithic stone axe quarries and production sites in Scotland and Ireland,’ in Ian A.G. Shepherd and Gordon J. Barclay (eds). Scotland in Ancient Europe. The Neolithic and Early Bronze Age of Scotland in their European Context, (Edinburgh), pp. 191-203.